We - "Livin' The Lore"
On this follow up to 1997's Wooferwheels, Norway's We give us another set of 'take no prisoners' tripped-out stoner rock. 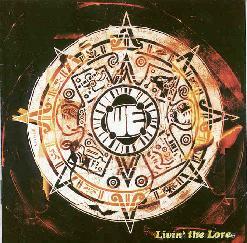 On Livin' The Lore the band is once again Thomas on vocals, Don on guitars, Goshie on bass, and Krisvaag on drums. The disc opens full blown with "Red Morning", which combines the recognizable We guitar sound with a lower end pulsing Black Sabbath sound and Thomas' intensely energetic vocals. I love Don's guitar style which blazes and destroys without self-centered flash. Stoner rock against a dark paisley background. "Shades We Wear" has a strong Led Zeppelin sound, though much darker. The solos are slow and non-technical but cut like a knife during both metallic and lighter psych moments. Other highlights include "Moanjam", the closest to being laid back that We gets. But laid back for them means easy going passages that ultimately burst into freakouts. Great acid metal guitar work on this tune. The nine minute "This Day" didn't grab me at first but it takes off in the second half for some of the most jamming psych moments on the disc. And "Peddler" is a hot rocker that struck me as a tune that could succeed on heavy rock FM radio. The final title track is another great Sabbath style rocker that disappointed me a little cause my CD player indicated it was 13 minutes making me think the band would stretch out big time. But it ends after just three minutes and does the silence thing a lot of bands like to do until the last minute which is just them screwing around talking and laughing. Still, like Wooferwheels before it, Livin' The Lore will appeal to doom metal fans who want to explore psychedelia, as well as heavy psych fans who wish to take a journey into stoner hell. One of the bands strengths is they have a distinct sound that sets them apart from their peers. Highly recommended to fans of acid drenched stoner rock.